You can thank Romhacking for FORCING me to take down all of this, even though I worked so hard. Re: I need Ideas For my Mario Hack and SNES Zelda Hack. I am not gonna give away my zelda alttp ideas. If i do it, then i am not gonna use BlackMagic from mathonnapkins. My awesome imagination is too limited in this case. - Ensure compatibility with hardware. Virtually every Super Mario World hack uses custom music, which in turn causes the game to freeze if you play it on a real snes. - Balance is key. Very few hacks tend to balance difficulty and throw in unfair sections. In a Mario hack, for instance, there should never be a level that can only be beat if Mario is in a certain state (like small, or with a cape). Remember the Miyamoto, philosophy: you can make a game difficult, but it should be fair. - Placement of tiles. 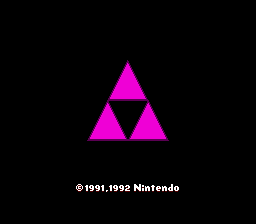 I've seen a lot of hacks, including a Zelda 3 hack that was published a few months back, where there was tiles that were out of place. In that particular example, there was a cave door that was not actually an entrance. - Changing graphics is easy, but tedious. It is probably much easier to start with changing level layouts, and change graphics along the way. ASM hacking is necessary to change the behavior of the game, and if you want to do anything fancy like in Brutal Mario, you are going to have to learn it. - Test your rom hack extensively before releasing it to public. Just look at the amount of garbage there is on Super Mario World Central, there is almost no quality control. As for ideas on the direction you take your hack, I think that is purely up to you. I don't think anyone here is going to give you any tips on how to approach your hack, so dream up something on your own. as for the Mario Hack, sadly it got deleted, the name of this topic is about to be changed. Re: I need Ideas For my SNES Zelda Hack. May be oldskool but its freaking HARD!!!! it will be hard because its the SMC its not any RPGmaker or anything like that, its just the romhack it will be very hard to do that as PW had a whole load of differences of PW but my HM doesn't say its a real Zelda Rom. Light world changed, now its purple. Water in light world is yellow, and for dark world Dark purple. Uncle looks way different, he has a gray suit now. Something i wanna admit, for the hack, i started on Puzzledudes hack, tell i decided, Neh i should just make a hack, i started around january 03, or some date like that. and on this day, several things have changed ((Barely anything like halve of the changes were made today, i even started at 2:00 AM and now its 6 AM. outta world map, i sure wish i went to go get the Acid water in that pic. I would think you a troll if your tone didn't seem so genuine. Oh, hey! How about making the desert white! It'd be like... A snowy place instead of a desert! 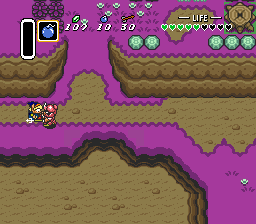 What sort of RPG elements would work in ALTTP? I always wanted to add classes and equipment and stuff like that. 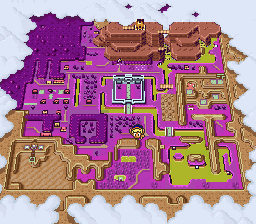 Here's an idea that I came up with, oh, sometime around 1999, that is ALTTP with elements from Final Fantasy Tactics and Final Fantasy 5. Mail (unsure) - 2nd best defense, allows jumping. Clothes - 3rd best defense, does not slow movement speed or reduce jump range. Robes - worst defense, but reduces MP usage and/or regenerates MP. Reduces movement speed and jump range. -Can shoot bomb-arrows, can shoot arrows in several directions, homing arrows, boomerang arrows that don't deplete your supply, charge attack that shoots arrows in all 8 directions. -Can shoot arrows without stopping (like the Crissaegrim in Castlevania: SOTN). -Hold down a button to remain facing in one direction while moving in another - so you can shoot while running away. -Allow shield use with crossbows? Weapon upgrades increase the number of arrows you can shoot. -4th = allows you to input however many arrows you want to shoot when you attack. Moves at 2x normal speed. Very weak and very short-range attack. Your weapon upgrades don't make it stronger, but instead it increases the speed of your attack. -Starting knife = 2x faster than vanilla ZALTTP Link's sword swing. -4th knife = as fast as you can push the attack button. Can use invisibility cloak, which does not grant invulnerability. You'll have to allow enemies to take damage when they recoil. In vanilla, I think they're invulnerable for half a second or something. Shoots fireballs, summons blizzards, and calls lightning bolts (LIGHTNING BOLT!) like Agahnim. Sort of like the Magic Orbs. Weapon upgrades - rods - reduce MP cost or regenerate MP? Or maybe you have several different types of attacks and the rods change the elements of those attacks? Weapon upgrades - staffs - do what? Or maybe replace Status Mage with a Bard? I think I filled a notebook with this stuff back in... 6th grade? I don't remember. There's no way in hell anyone could make ALTTP do all this; I just wanted to nostalgia. Anyways, what is hackable in TLOZ - ALTTP? Enemy stats? Items? 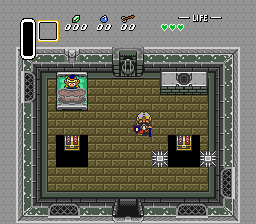 There will be secret entrances to ganon, I have not tested out ganon's place myself, Infact I am still running the game, Making sure everything is possible without the game screwing up. Very very very MANY bugs were found and alot is fixed, If your surprisly around the 7th crystal, and confused just like me, You can not blame yourself, right now I am gonna fix this problem, and yes, I tested out cheating abilites, and I suggest you might want to not put codes that glitch you, Some stages are possible with only 5-6 hearts, (your lives )) And there is very many glitches that occur when you defeat a enemy boss that is not really a "Enemy boss" its just spawned there, everytime you kill it there is a %50 chance a heart drops, which can make you get 20 hearts quick, I just hope you guys do not do that yet. Nooo! Keep working on it! I had so many ideas for this! Wait... What happened that you had to take this down? I don't see any reason, unless you uploaded the hacked rom. In that case, you'd only have to fix the link so it only points to the patch itself. It is against the rules to post links to roms, hacked or not at RHDN. It was a folder containing not just his edited ROM, but several others as well,. He or she didn't have take it all down though; could have just uploaded the patch alone somewhere else. :/ Oh well. I still can't figure out... was this a massive troll, or could they really just not figure out how to zip and upload a single file? Where's the Emulation Police when you need them?! ?